Brexit - Is your supply chain ready for the bumpy road ahead. The 29th of March is weeks away and as each day goes by it looks as though a 'no deal' is going to be a stark reality for us all. The UK government is telling us that they are still very much hoping for a deal but a lot of information is being generated to prepare us all for the worse-case scenario, being that if we leave the EU without an agreement we will default to The World Trade Organisation (WTO) rulings, which means UK businesses will have to add customs,excise and VAT processes to goods traded with the EU, not only that there will be a return to border checks at the ports which will undoubtedly see a surge in delays. Do you import or export to the EU? If you export or import to the EU, then the below information will really assist you in your planning. Check out the government's latest EU Brexit help page this is a very informative tool that covers all the basics to allow you to continue trading with the EU after Brexit. Key information regarding a possible 'no deal" assisting you with preparing for what is going to happen at the borders if there is a 'no deal'. 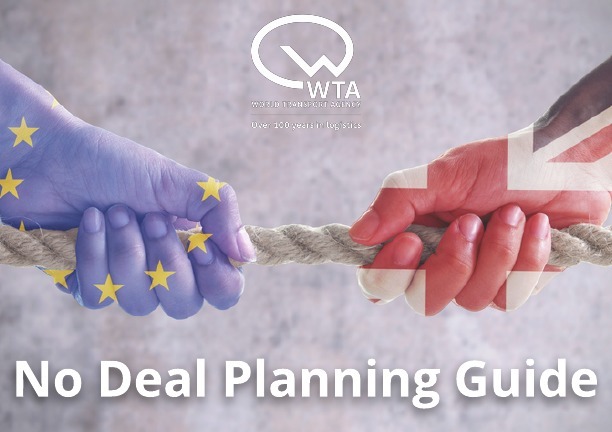 This is a far more detailed outline regarding the procedures and processes which are like to apply in a 'no deal' situation. WTA UK is well positioned to deal with any outcome that Brexit delivers, we will ensure that all of our truckers have the necessary permits, we are ensuring that all of our clients have the best possible routings for their shipments, Plus we work very closely with our port handling agents to ensure that our customers receive preferential treatment. We cannot stress enough that it is not too late to start preparing now. Have you considered applying for AEO status? Recently WTA was successful in regaining its AEO accreditation which gives us a trusted trader status giving a possible faster route to market for our clients.